One of the themes we return to again and again is the idea that teams can buy a championship. The story is that those who spend the most have the best players, and those with the best players will win the championship. 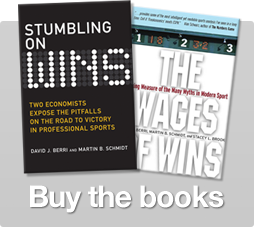 We talk about how payroll and wins are not strongly linked in the book. How about the link between being the best and winning the championship? In the regular season the Detroit Red Wings posted 58 victories, five more than their nearest rivals. For this effort the NHL gave Detroit the Presidents’ Trophy. Of course the ultimate prize in hockey is the Stanley Cup. Four games into the playoffs and Detroit has already dropped two games. Is there reason for hockey’s best regular season team to be concerned?The President’s Trophy has been awarded since 1986. Of the nineteen previous winners, only six managed to also take home the Stanley Cup. So the NHL’s best team has had about a one in three chance of winning the Stanley Cup. In other words, recent history tells us that Detroit has about the same chance of winning the Stanley Cup as you do of winning one game of rock-paper-scissors with your child. Such odds should not warm the hearts of Hockeytown, where anything less than the Stanley Cup will be a disappointment. 2 Responses to "Will Detroit win the Stanley Cup?" That may be true about the odds but the last team to win the Presidents Trophy and the Stanely Cup was Detroit so don’t talk about Detroit like that.